Once the fourth largest lake in the world, the Aral Sea has shrunk by 90 per cent. Lying between Uzbekistan and Kazakhstan, the Syr Darya and the Amu Darya rivers that fed the sea were diverted in a 1960s Soviet project to boost cotton production, leaving what had been water now arid land. Desert covers 80 percent of the country and is spreading each year, due to chronic drought. Once an important seaport but now sitting dozens of kilometres from the shoreline of the Aral Sea, the town of Moynaq has seen the human cost of the man-made ecological catastrophe that took place here. The shrunken sea has ruined the once-robust fishing economy and left fishing trawlers stranded in sandy wasteland. The sea's evaporation has also left layers of highly salted sand, which became polluted with fertiliser and pesticides. This contaminated dust from the now exposed lake bed became a health hazard for locals, as winds carried it to towns and cities. As it settled in fields, it degraded the soil. The loss of the lake also changed the weather, making winters colder and summers hotter and drier, further exacerbating the drought and its effects. As the lake has receded, so too has the town's population and the tourists who once thronged the shores of the lake have disappeared. Now university students, supported by the Uzbek government, are planting fruit trees in an initiative to transform the landscape – for the better this time. Dean of the faculty of environment at Karakalpak State University, Yakub Amedov, explained: "Our main aim is to improve the environmental situation in the Moynaq region. President Shavkat Mirziyoyev supports any initiative of the development of the region. "Today we're planting plum, grapes, apple, apricot, cherry. In the future, we plan to make an educational site for students." This planting is one of the most effective ways to stop the process of desertification, according to Vadim Sokolov, of the International Fund for Saving the Aral Sea. 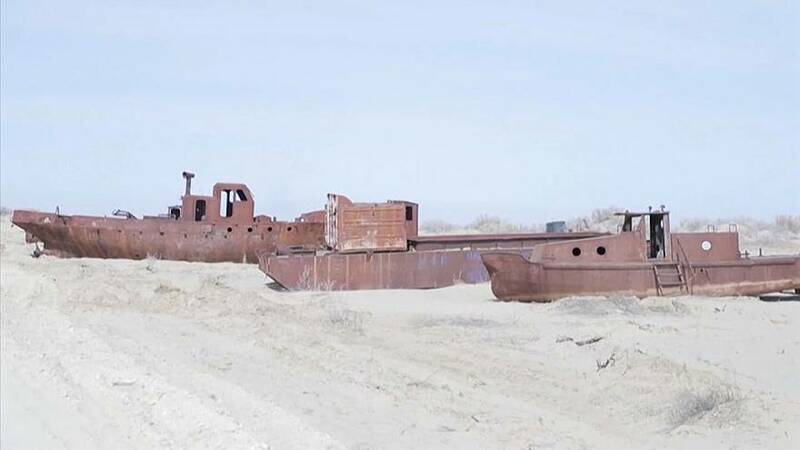 "One of the key ways to prevent the spreading of salt and chemicals that have accumulated from the Aral Sea is by tree planting and fixing the sand from the dried-up sea bed," he said. Sokolov hopes to plant trees across a million hectares of the territory – one-third of the desert that was once a seabed.